This Journey is 2 loops. I have been teaching it this week and everyone seems to love it. I added the oldest spin song I know. I never knew the name until I started teaching. Must be some spin teacher secret but I’m going to share it with you. Best song to finish with. This journey is a 60 minute class. Saltwater (Original Radio Edit) – Chicane (3:30) 131 BPM: This is a fantastic warmup song. Nice steady cadence. I introduce single leg pedaling here so that cyclists can connect to the whole pedal stroke 360 degrees. Start by pedaling just with your right leg, let your left leg go limp. Connect to the whole circle of the pedal stroke and then switch to the left leg. Good Feeling – Flo Rida (4:07) 128 BPM: Great song to continue the warm up. At this point everyone feeling good! 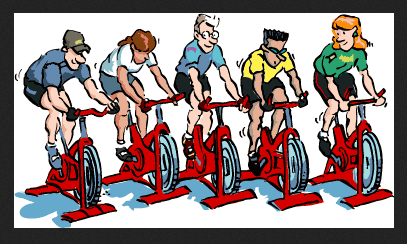 Get them moving through the different positions on the bike; position 2 and 3. Position 2 – standing jog – pay attention to form – pull knees up to the handle bars, light on the hands, weight in legs. Position 3 – aerodynamic – get low, tail bone over the saddle, engage core, fire hamstrings. Niton (The Reason) – Eric Prydz (8:05) 128 BPM: Intervals – equal work to equal recovery. The goal is to get your heart rate high for each interval. There are many benefits to high intensity interval training: it’s efficient, you burn more fat, strengthen your heart, increases your metabolism and it is challenging. For more info on the benefits click here. 15 on/15 off, 30 on/30 off, 45 on/45 off, 60 on/60 off, 60 on/60 off. To make it more challenging increase resistance 15 sec before the end of the interval. Seated for recovery, standing for interval. Viva La Vida – Coldplay (4:01) 138 BPM: Coldplay is one of my favourite bands. Their songs always makes me want to move. Seated climb – 8 turns up every 30 seconds. Get on a hill and pedal to the beat. Each turn ask for more, don’t slow down as the tension increases. Make the last turn be at the beginning of the next song a huge turn to slow the resistance down to the speed of the next song. Sweeter – Gavin DeGraw (3:43) 92 BPM: Slow heavy climb in 3rd position- go as heavy as you can. Highest tension on the steepest hill without stopping. Keep the tension on for 2:43. For the last minute (2:43-3:43) take the resistance down slowly with 3 turns down back to neutral to start the next song. Don’t Wake Me Up – Chris Brown (3:42) 128 BPM: This is intervals. Neutral on your tension and then add on resistance for each of the three intervals of 23/30/23 at 1:07-1:30, 2:22-2:52 and 3:07-3:30. Each interval push heart rate to the line of anaerobic. Locked Out of Heaven – Bruno Mars (3:53) 144 BPM: Up and Out Jumps – Start seated then go to postion 2, position 3 and back to seated. Start with neutral cadence, each time through give it a little turn to the right to add it on. Each turn requires more work. Keep turning until you are at the maximum limit of tension to hold the cadence. Start with slow jumps move positions every 20 seconds, then move to every 10 seconds, then every 5. By the end it will be high tension and quick movements. Kind of like you are being bounced around. Kiss You – One Direction (3:02) – Race through the first loop – fast flat – pushing speed. Make sure that you have resistance on. No granny gears! Go as fast as you can. Have you ever seen a One Direction concert? OMG…screaming girls…I couldn’t hear for 3 days…I am a good mom :). First loop DONE!!! Second loop begins. I Got More Than a Feeling – MadMixMustang [Black Eyed Peas vs. Boston] (5:04) 127 BPM – This is a Mashup – where you take 2 or more songs and mash them together. I love this one. It has great energy. Back to a seated climb with 8 turns up. I Want to Break Free – Queen (4:22) 108 BPM – Slow heavy climb in 3rd position- go as heavy as you can. Highest tension on the steepest hill without stopping. Keep the tension on for 3:22. For the last minute (3:22-4:22) take the resistance down slowly with 3 turns down back to neutral to start the next song. Suddenly I See – KT Tunstall (3:21) 100 BPM – This is intervals. Neutral on your tension and then add on resistance for each of the three intervals of 20/20/40 0:40-1:00 2nd 1:35-1:55 3rd 2:33-3:12. Each interval push heart rate to the line of anaerobic. Pick up the Pieces – Average White Band (3:58) 107 BPM – Out and Back Jumps – Start seated then go to postion 2, position 3 and back to position 2 and then seated. Start with neutral cadence, each time through give it a little turn to the right to add it on. Each turn requires more work. Keep turning until you are at the maximum limit of tension to hold the cadence. Start with slow jumps move positions every 20 seconds, then move to every 10 seconds, then every 5. By the end it will be high tension and quick movements. Kind of like you are being bounced around. Sandstorm – Darude (6:38) 136 BPM – This is the secret song (sorry now that you know I may have to kill you…unless…you ride it well ;)) Race to the finish fast flat – pushing speed. Make sure that you have resistance on. No granny gears! Go as fast as you can. Right away get moving. There are 2 breaks in this song…earn them! break at 1:00 and at 3:14. True Colours – Artists Against Bullying (3:50) Cool Down – Jacob Hoggard, Lights, Pierre Bouvier, Fefe Dobson, Kardinal Offishall, Alyssa Reid, and Walk Off The Earth teamed up to show their support for the anti-bullying movement and record Cyndi Lauper’s classic True Colors. All proceeds from the sale of this song will be donated to Kids Help Phone. Nice feel good cool down song. A Thousand Years – Christina Perri (4:45) Cool Down – This is from the Twilight movie. Ok…I loved all the movies…especially the last one. I went to see it with my girls and a theater full of screaming teens. Too bad Taylor Lautner didn’t take his shirt off more in the last one. And we all live happily every after….forever and ever. If you are only looking for a 45 min. take out Kiss You and Sandstorm. This entry was posted in Cycling Journeys and tagged cycling journey, indoor cycling, indoor cycling music, spinning, spinning journey, spinning music, workout music. Bookmark the permalink.